Om få dager reiser Nidarosdomens Guttekor til Moskva for å synge sesongens 25. julekonsert i Svetlanov Hall foran 1700 mennesker. Moscow Performing Arts Center har invitert koret til å holde konsert under den årlige Moscow Christmas Festival of Sacred Music, med på laget er domorganist Magne H. Draagen. På festivalen er guttekoret i meget godt selskap: Få dager før vår konsert synger «The King’s Singers» på samme scene, dagen etterpå spiller National Philharmonic Orchestra of Russia avslutningskonserten under Vladimir Spivakov. Selvfølgelig vil koret gi en eksklusiv opptreden i den Norske Ambassaden i Moskva også. November-desember er korets høysesong, fra 24.11.18 til 24.12.18 sang guttekoret 24 julekonserter i Trøndelag og Oslo, til sammen for godt over 15.000 mennesker. Hvert år siden 1930-tallet har Trondheims Guttekor spredt julestemning iblant byens befolkning i Nidarosdomen gjennom sine julekonserter, og i nyere tid har koret også jevnlig holdt julekonserter i de europeiske hovedsteder i tillegg. Men våre røtter går mye lengre tilbake: Helt siden 1100-tallet har gutter sunget ved Nidarosdomen i Trondheim: Nidarosdomens Guttekor – guttestemmer med 1000-års etterklang. Senere i 2019 er koret invitert til å synge en stor konsert i Esplanade Concert Hall i Singapore, før koret starter i en ny julekonsert-sesong. Følg med på våre nettsider og på Facebook for mer detaljer. Kjøp billetter til vår konsert i Mosvka. In a couple of days, Nidarosdomens Guttekor travels to Moscow to sing the season’s 25th christmas concert i Svetlanov Hall (1700 seats) in Moscow, Russia. Moscow International Performing Arts Center has invited the choir to give a concert during it's annual “Moscow Christmas Festival of Sacred Music”, which is held for the ninth time in 2019. Cathedral cantor and master organist Magne Draagen is accompanying the choir during this concert. During the festival, our boy choristers are in very good company: three days prior to our concert, The King’s Singers stand on the same scene, and the day after our concert National Philharmonic Orchestra of Russia, conducted by Vladimir Spivakov plays the festival’s closing concert. Of course, the boys’ choir will visit the Norwegian Embassy too. The choir’s busiest season are the months of november and december: between 24th of November and 24th of December, the Trondheim boys sang 24 christmas concerts in Norway alone. In total the boys have sung for an audience of over 15.000 people in this month alone. Every year since the 1930s, the boys’ choir has spread the christmas spirit through its concerts, and since the 1980s the choir regularly visit European capitals with it’s Christmas Programme too. 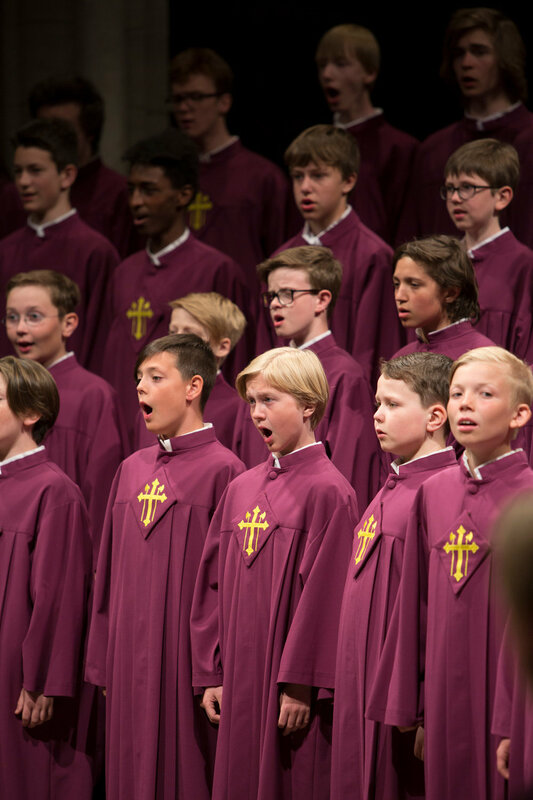 The boys’ choirs roots date back far further than 1930s: ever since the 11th century, boys have been singing in the Nidaros Cathedral. It is said that the cathedral’s stones carry the echo of a thousand year of our boy chorister’s singing. Later in 2019, the boys are invited to sing concerts in Germany, Denmark and Singapore - before a new busy christmas season begins anew. Follow the boys’ adventures on this website and on Facebook. Click here to buy tickets to our concert in Moscow. Older PostNytt år, nye muligheter!